In the space of five years, between 2004 - 2008, Lake Huron has undergone dramatic changes that have altered the fishery and given rise to a significant paradox for fishery managers about how to best balance a changing ecosystem with competing interests in the face of uncertainty. These challenges are not limited to Lake Huron: indications are that the ecosystems of lakes Michigan and Ontario are also changing in ways that mimic the ecosystem changes seen in Lake Huron. The alewife, a pelagic planktivore native to the Atlantic Ocean, entered the Great Lakes through canals. First seen in Lake Ontario in 1873, and bypassing Niagara Falls through the Welland Canal, the species became widespread in the basin by 1960. Alewives became so abundant that they exceeded their carrying capacity in lakes Michigan, Huron, and Ontario, resulting in massive die-offs that littered shorelines and beaches. The invasion of alewife, coupled with overharvest and the havoc wreaked by the noxious sea lamprey, led to the extirpation of lake trout - the native top predator - from most areas of the Great Lakes. Public demands for action compelled fishery managers to consider stocking Pacific salmon to control the invasive alewife, while simultaneously establishing a recreational fishery. 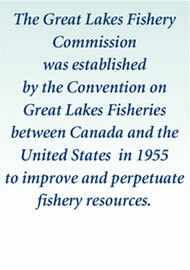 The State of Michigan first began this practice in earnest by stocking coho salmon into Lake Michigan in 1966. This effort was an unqualified success. The newly introduced salmon consumed alewives, reducing their numbers such that die-offs did not occur. By the mid-1980s, the biomass of alewives in Lake Michigan was less than 20% of the historic high. At the same time, salmon grew rapidly and formed the backbone of a recreational fishery that today is conservatively estimated at $7 billion annually. The phenomenal fishery led to the widespread establishment of a successful charter boat industry for the stocked Pacific salmonids. Management agencies continued to stock Pacific salmon in increasing numbers, with more than 25 million fingerlings being stocked in the Great Lakes basin during the early 1980s. Initially, managers were quite pleased with results, because harvest increased linearly with stocking increases. Yet, during the late 1980s, alewife populations were declining and, as a result, so was the size of salmon. In response to pressure from recreational fishers, management agencies eliminated commercial fisheries for alewife by 1991 because the commercial fisheries competed with salmon for alewife. Agencies also reduced the number of stocked salmon in an attempt to balance predator (salmon) abundance with lower levels of prey (alewives) to maintain a highly valuable, but much smaller recreational fishery for Pacific salmon. As a management philosophy, balancing predator (Pacific salmon) with available prey (alewives) prevails. Although alewives serve as a key source of food for Pacific salmon, they also have a down side. The species exerts strong, negative impacts on many fish: they consume the pelagic early life stages of native species such as yellow perch and lake trout and compete with coregonines for zooplankton. Further, alewives contribute to Thiamine Deficiency Complex which impairs early development of salmonines, thereby threatening the rehabilitation of native species as well as the viability of stocked fingerlings. New invasive species - such as zebra and quagga mussels - are also exerting adverse impacts on the ecosystem. Since 2002, cladocerans, a type of zooplankton, have declined by 90% in Lake Huron thereby reducing the food available for early life stages of pelagic fishes. Alewife populations collapsed after 2003 resulting in fewer resources to sustain the salmon fishery. Compounding the pressure on alewives, Chinook salmon are now naturally reproducing in lakes Michigan, Huron and Ontario resulting in a higher demand, yet fewer resources to sustain alewife and hence Chinook salmon. Since 2004, the Lake Huron system has changed from one dominated by alewife and Chinook salmon to one where alewife have been nearly eliminated and Chinook salmon biomass has been reduced to a fraction of their recent (pre-2003) biomass. As a result, angler effort has declined by about 90% and recruitment of native fishes, including lake trout, walleye, cisco, bloater, and emerald shiners, is increasing. Thus, the introduction of some unwanted aquatic invasive species is changing the ecosystem from the state desired by anglers (strong Pacific salmon fishery) to an alternative state where native species are becoming dominant. Fishery managers must now make the difficult decision of whether to manage for short-term economic success by attempting to maintain a balance between the demand for Pacific salmon fisheries and the declining alewife populations that support these fisheries, or to embrace ecosystem change and manage primarily for rehabilitation of native fishes that appear to be better suited to the ongoing ecosystem changes. The case can be made for managers to direct fewer resources toward active management of Pacific salmon in favor of efforts to restore native species in a changing food web. Conversely, the popular and economically important recreational fishery for Pacific salmon creates an environment in which managers are pressured to maintain the Pacific salmon fishery at least at current levels, despite a reduced capacity in the ecosystem to provide for the very characteristics desired by the anglers: high catch rates and large size. Although this decision choice may become moot following fundamental ecosystem shifts, this remains a significant paradox for fishery managers.